The Mission Era of California may seem worlds away from our modern day skyscrapers. The Native Daughters have labored to help restore and preserve the beautiful monuments which are found in our twenty - one missions, creating learning centers for children and adults alike. On Friday, August 8th, 2014 members of San Diego Parlor No. 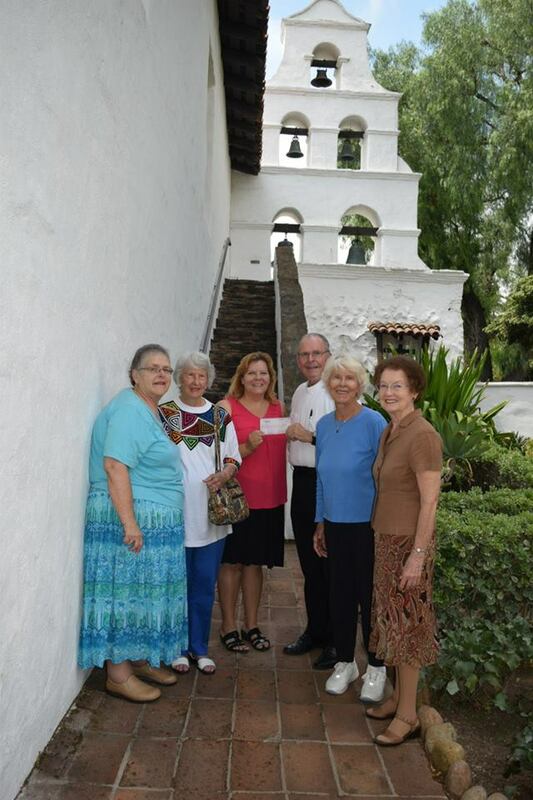 208 Marie M. Otto, PGP, Barbara Tollison, Marie Taylor and Geraldine Martinez presented a check from the Mission Restoration Committee to San Diego de Alcala Mission, the first of the California missions. Receiving the check were Msgr. Richard F. Duncanson, Pastor, and Iris Engstrand - Mission Historian.